It is standard for every car to have headlights and you may have to replace your stock from time to time. An automotive conundrum may have you boggling for some time now – should you switch to LED? If you weigh things properly, it will always be the wiser choice to switch. We have a separate section below the review that explains why you should upgrade to LED headlights. If you’ve made your mind and finally decide to commit to an LED-type, here are ten of the best LED Headlights currently in the market! 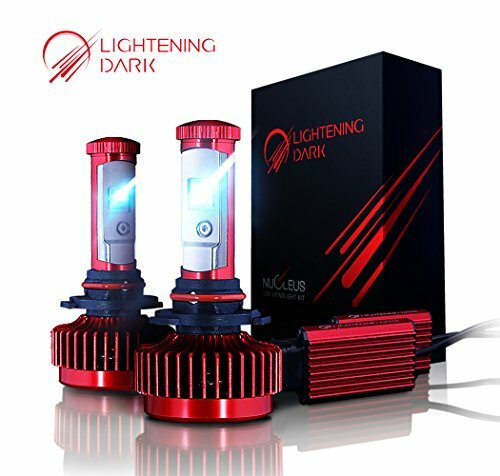 Why You Should Switch To LED Headlight? This section gives in-depth reviews of the best LED headlights you can buy today. If you’re here for a quick shopping, you can go directly to the buyer’s guide below as we have wrapped things up there for fast selection. Before you continue, it is important to note that LED headlights can be divided into two categories – single beam bulb and dual beam bulb. It is a common knowledge that all cars must have both high and low; and LEDs have adhered to this rule with a little trick. An LED light can achieve both high and low beam function by using only one, individual bulb designed to integrate both. These are the H4, H13, 9004, and 9007; and are called as Dual Beam Bulb. This type only has one bulb per unit; and is capable of functioning as two beams. There are also LEDs designed with two separate bulbs – one is for high beam and the other for high. This is called the Single Beam Bulb. Included are the 9005, 9006, 880/881, H1, H3, H7, and H8/H9/H11. If your car came with dual beam bulbs, then you have no choice but to only choose among those dual beam options. The same goes for single beam headlights. Unfortunately, these two styles are not interchangeable due to wiring compatibility – your car will only work with the default style and not the opposite. 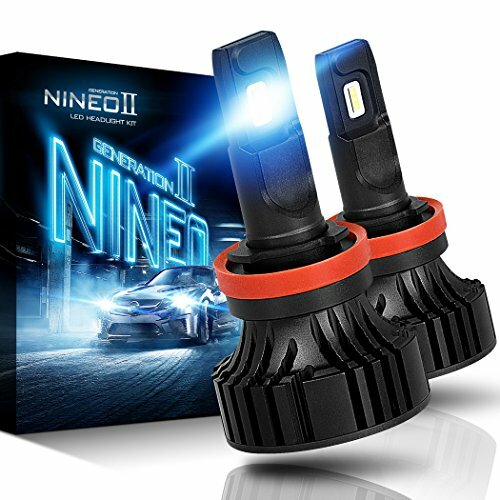 Driving nights will never be dark again the Nineo H11. It comes in pair with each bulb able to emit 3600 lumens for a total of 7200 lumens per pair. What makes this product appealing is it’s twice as bright as your conventional halogen headlights and at the same time, have a lifespan of up to 50,000 hours. That’s like driving for 2083 days or 5.71 years non-stop! Another thing you’ll like is the perfect beam pattern that absolutely produces no foggy light and any dark spots thanks to the embedded NINEO technology. Importantly, this one has automatic short-circuit protection. Added perks include heat and water protection feature with integrated fan and cooling chip that works even in harsh conditions. This LED headlight features a 7000 RPM (revolutions per minute) Turbo Cooling Fan and an Aluminum heat sink; together they promote a powerful heat dissipation that makes the unit 30 percent cooler than your stock halogen. This next generation professional automotive LED lighting is designed for easy installation; simple plug and play. It can be installed in a mere 20 minutes without extra wiring, capacitors, or relay. The Nineo can be installed in most vehicles as the CanBUS-Ready technology is compatible with most automotive computer system. However, the manufacturer produced a list of LED-sensitive car brands that may possibly work with error with this model. The list includes BMW, Volkswagen, Ford 2013 & up, Jeep 2005 & up, and Volvo. If your car experiences flickering, you can contact the manufacturer directly to have them give you the right decoder for your car model. Note: If error or flickering occurs, contact manufacturer as they can provide the proper decoder for your car model. Now this one is as bright as the Nineo H11 – 7200 lumens for the pair (3600LM for each bulb). However, this one boasts 10,000 RPM of powerful turbofan; that’s 3,000 RPM more than the Nineo H11 above. Having a superior turbofan means the unit is not prone to overheating and is cooled in the most effective way possible. This also promotes an optimum lifespan so you can be sure your unit will last the expected lifespan – 50,000 hours of unwavering bright light. Thanks to decades of technological advancements, you now have a waterproof unit with a reliable fan that works even in tough conditions. This CougarMotor is also twice as bright as your stock halogen lamp; it almost feels like you are driving in daylight with this one. It is also designed to produce perfect beam pattern – say goodbye to foggy lights and dark spots. Like the previous model above, this one can also be installed in a mere 20 minutes. The H11 is also compatible with most car models with the CanBUS-ready feature. 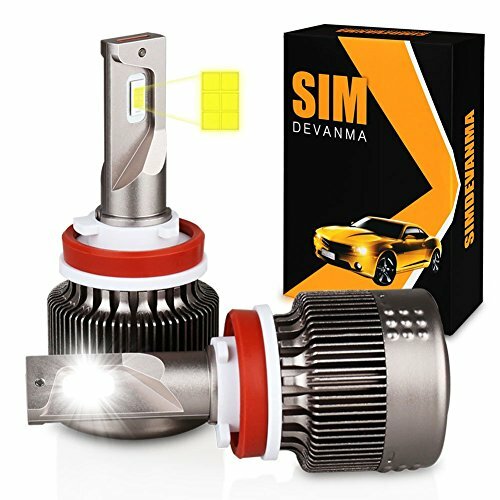 You can contact the manufacturer first to confirm whether your car model is well-matched with this LED headlight. Note: You just have to be resourceful enough to make little adjustments in the housing. This thing can still be installed without much difficulty. If 7200 lumens is not enough, then you can go for an 8000-lumen model. The MicTuning offers a brighter solution for the same price range. It also has the same 6000K cool white temperature but with 80W per pair. Not surprising considering this one emits 8000 LM. This still has the same features to love such as a perfect beam pattern, but with a lesser expected lifespan of about 30,000 hours compared to the 50,000 hours of the previous two models. This is the compensation you have to sacrifice for the brighter lights. The cooling fan rotates at 7000 RPM, making this one 30 percent cooler than conventional headlights in the market. It also has zero warm-up time; instantly turns on without any ado. Further, it has premium aluminum housing and waterproof at the same time. CanBUS ready technology means this one can be installed harmoniously with most computer systems while the plug-and-play feature promises less than 20 minutes of instalment time. The manufacturer produced a list of car models that could possibly not work properly with the unit – Audi Q7, VW PASSAT, MINI, and BMW. You may need a decoder (load resistor) which you can acquire by simply contacting the manufacturer. Do this if you notice imperfect lighting or flickering in the lights after you have installed them. CanBUS-ready; great with most computer systems. Note: Simply email/contact the manufacturer for the right decoder for your car model. It would be hard to define dark with the super bright 7200 lumens of the Lightening Dark H11. Equipped with the best type CREE XPL LED, this is the perfect upgrade from your standard HID or halogen headlight. This unit comes with the latest optics that is able to provide you with the best angle for optimum visual and safe night driving. Now you have a seamless beam pattern without any fog and dark spot in an illumination that is twice as bright as your stock headlights. You can also ensure you have a robust, and durable unit that is water proof and housed with an air-craft grade aluminum. Further, these materials can withstand harsh environments and extreme driving conditions. This one is designed to achieve up to 95 percent of light efficiency thanks to the heat resistance technology brought by the 8000 RPM turbo cool fan. Generic LEDs can only cool half as fast as this model. High speed dual cooling and bigger heat dissipation area helps the bulb achieve its expected maximum life expectancy of about 50,000 hours. Like the models above, it has similar features such as easy installation (plug and play), CanBUS-ready, and zero-second start-up. Importantly, it comes with 3 years of warranty so you can be confident when you buy this one. 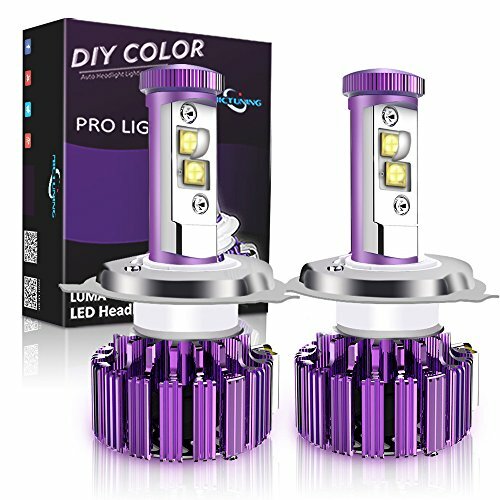 Now this is a highly recommended headlight for people who wants to mainly convert to LED and is not after ultra-bright applications. Brighter is not always better. This one produces 6000 lumens which is noticeably lower than the other models I featured. However, this is quite enough if you only want to convert to a more efficient LED type from your stock halogen or HID without wishing for a blinding brightness. Don’t underestimate this one; it is made from an aircraft grade luxury gold aluminum material. 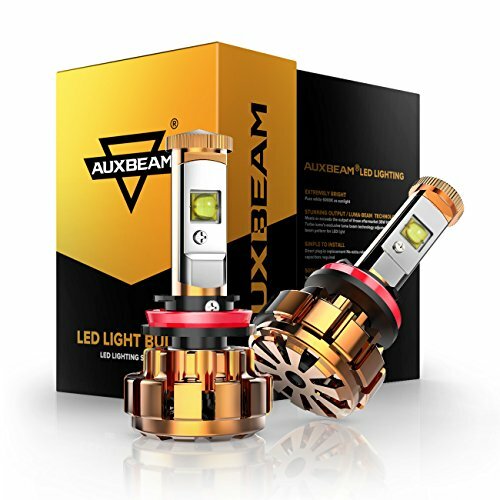 This Auxbeam doesn’t fall short of other features as it’s crafted with high-class CREE chips – the best choice in the market. Also it is still at par when it comes to color; 6000K of white light that is enough not to blaze your opposing traffic. It comes with pretty much other standard features such as 360 degree light angle and a perfect beam; no dark spots and foggy experience. Now this is ideal for people who want to have just enough but still an improved driving experience with a more efficient LED headlight system. Note: Make sure that what you got is from Auxbeam. Contact Auxbeam for a refund if you receive their product from another seller. Note: Immediately contact the manufacturer if you experience flickering especially if you own a Mini Cooper. Now make way for this superstar; this one has got many sales despite priced twice as much as the other models I featured on my list. Could this be the best LED headlight? For starters, this one emits 3500 lumens per LED for a total of 7000 lumens for the pair. It also uses Arc-Beam technology and CREE MK-R LED that the manufacturer boasts to be the only model using the said technology. What makes this one quite appealing is it can last OVER 50,000 hours! Or so the manufacturer says. But you got to see for yourself. The secret behind is the TurboCool fan, solid aluminum build, and RedLine driver. You won’t be needing any expert assistance because this one can be installed right out of the box. You can also be confident this one is compatible with most computer vehicle systems in the market so it would be a rare case if your car isn’t. Simply contact the customer hotline if you have any issues. There is also a car selector in the page (click here) to see if your car is well-matched with this model. Standard HID lights may take as much as 8 seconds to obtain maximum brightness. On the other hand, this Fluxbeam can obtain 6000K and 7000 Lumens in zero seconds! Maximum light the moment you click it. This one also boasts 7000 RPM dual speed TurboCool fan, 35 percent higher heat reduction with the cold pressed aluminum heat sink, compact Redline LED control driver that regulates safe power, and optimum heat protection with unswerving bright output. Its most appealing aspect is the manufacturer has taken into consideration to put all things you need in the package. No more extra purchases that lead to disappointment. Everything you need is already in the box. Further, you can install this one with a breeze without any expert assistance. Now make way for another 8000-lumen wonder. If you’re a fan of super bright lights, this one is a good choice. You’ll never see dark again with the illumination this LED can produce. The design is also quite simple; just plain aluminum/metallic grey and doesn’t come in stylish colors like other models. But hey, it’s the light that matters. Though it can produce an astonishing 8000 lumens of bright light, this one falls a little short to the beam angle. This one can emit light at (only) 320 degrees. But it’s not much of a downside. What’s important is it can provide a perfect beam with no foggy experience and dark spots. When you come to think of it, you won’t need much of that 40 degrees (20 degree angle on each side) of beam light because a driver must focus on what’s ahead and not on the side. Matter of fact, this comes as an advantage because you won’t be blinding the driver on the opposite lane with your ultra-bright 8000 lumens! More importantly, this one can still achieve a 50,000-hour lifespan despite being so bright. Quite an impressive feat. Standard features include waterproof bulbs and strong fans. Note: Models like Mercedes Benz may need an adapter to hold the unit in place. However, there are available products you can buy from the manufacturer. Note: You can make a simple troubleshooting. Simply switch the male connector to the opposite side and plug in the female outlet. Note: You can contact the manufacturer for the right decoder for your specific car model. All the way from Japan, the HIKARI LED is probably the new headlight you’ve been waiting for. The origin says it all. The most popular LED headlight in Japan, giving you a hint of how good this product is, has finally come to the United States. Each bulb produces 3600 lumens making it 7200 lumens for the pair. You can guarantee great quality with this one. It is crafted with premium aluminum design – a catalyst for efficient cooling. Exceptional heat dissipation is brought by the built-in fans. Further, it has a water driver and can protect against fan-failure and over-heating. This one also has two of the most important elements every LED light must possess – seamless light pattern and superior brightness. 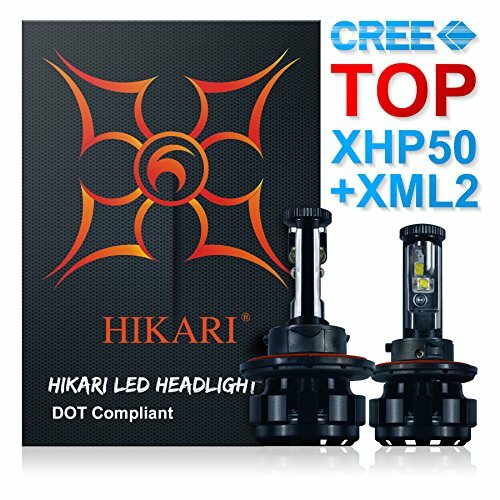 HIKARI is also the only brand in the market that utilizes AI Frequency Technology with CREEXHP50 LED to ensure the light pattern is faultless, quite concentrated, and can reach far. Everything that makes an LED great is met. Note: The manufacturer promises great customer service; feel free to contact the manufacturer. Now this one looks oh so premium. The turquoise metallic color that matches with the box implies this one’s serious and up to the task. Impressively, this one is an 8000-lumen giant! And the only item on my list to produce 6500K of white light; you can expect this one to provide greater visibility. Not surprising, the expected life expectancy is 10,000 hours short of other models considering the brightness it can emit. This one can last up to 40,000 hours of unwavering shine; which is still pretty good enough and quite better than standard halogens and HIDs. The manufacturer boasts this one is made with the latest CREE XHP50 LED Chip. Standard features include no dark spots, anti-glare body, and great beam pattern. You can also expect color consistency and dependable lumen density. 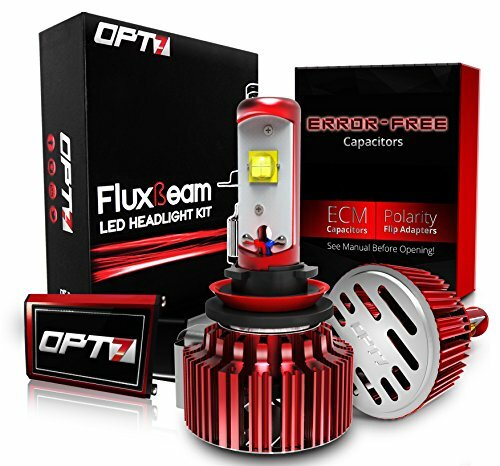 You can now kiss goodbye to your current projector lamp bulbs, HID, or Xenon, as the perfect replacement is now already available at hand. Vivid and distinctive, you have a zero start-up time LED bulb ideal for use in fog lights, high beam, and low beam. An attractive feat is the adjustable beam pattern that paves the way for projector housing or reflector. This one is also easy to install, usually takes you not more than 20 minutes. You can plug this directly to your OEM sockets. Upgrade your car with one of the best in the industry. This one throws 12,400 lumens! Yes, you read it right. It would be so hard to find a model that can compete with this one. The SNGL boasts an exclusive patented technology – adjustable beam function. With this, you can achieve a desirable beam pattern beneficial both for you and the driver on the opposite side. Other LED lights also emit high lumen but could possibly have no direct light on the road, which is supposed to be the most important thing. Additionally, high lumen could result in glare – like a blinding disturbance to the oncoming cars. But this one is an exemption. The manufacturer prides itself to have the ultimate in the market today. The LUMILEDS embedded in the unit are customized LED Chips made exclusively for SNGL. The brand promises a robust headlight kit that you can depend on. Embedded noise filter and improved EMC design promotes effective noise reduction for an ensured smooth and quiet driving experience. Further, this unit is equipped with a couple of safety features such as protection against undue current, excessive voltage, pulse or electrostatic threats, and fan failure. An impressive feat is the smart cooling system that doesn’t put the unit at risk of rapid light decay due to high temperatures above the light’s comfort zone; a common problem in ordinary LEDs. 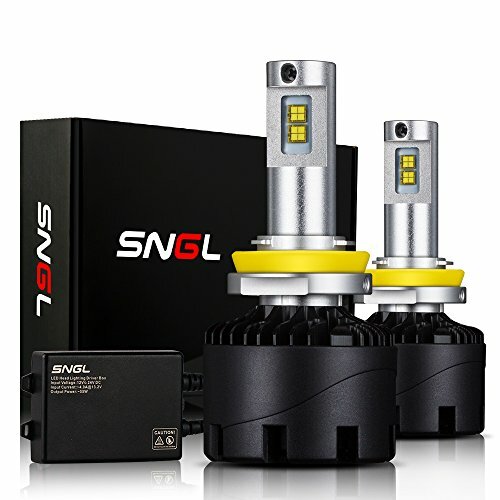 CanBUS ready, this SNGL is compatible with almost all types of vehicles in the market. With the adjustable beam, the SNGL offers something that you can rarely find on other brands. This headlight is engineered with high quality components, making it the best LED headlight upgrade to your stock headlights. This one really screams awesome. Note: Contact customer service for assistance. What’s with LEDs? In the first place, why should we replace my stock halogen or HID with this type? We have grown up loving high-intensity discharge lamps and halogen, why should we embrace this change? Should we switch? The answer is an absolute YES. There’s no other way around. Here are some of the reasons why you should switch to LED headlights. In almost all cases, the brighter the better. Headlights made with Light Emitting Diodes can emit superior intense light but consume very little from your vehicle’s electrical system. That’s the main beauty of it. Your car battery will be grateful because it can save up juice with this type. Lumens is the unit of headlight brightness. LED headlights can throw more than 6000 lumens when turned on. On the other hand, ordinary halogens can only produce around 1200 lumens on high beam and around 700 lumens on low beam. This should give you a clear picture of how LEDs are far brighter than your stock. Did you know? The average lifespan of an LED is actually longer than the life of your car itself! Another benefit you’ll enjoy is economy – in both cost of operation and lifespan. LED lights can operate up to 50,000 hours and even more in some brands. On the flipside, conventional halogen bulbs can only live as far as 2000 hours. Compared to an incandescent bulb, an LED can consume energy up to 90 percent less! Talk about economy. Since they only need less power, your LED headlight will not make your car engine work as hard, consequently reducing its load and saving fuel. LEDs may have a higher initial cost than halogens but they sure can compensate the cost to long-term benefits in the form of extremely low operational costs. At the end of the day, LEDs will remain the practical choice. Though it is used more in actual temperature applications, the unit Kelvin is also used to measure the color temperature of both light-bulb-produced light and natural light. The beauty of LEDs is they have the power to produce white light that almost resembles daylight. Night driving will never feel like night anymore. The fundamental rule is the higher the “K” the better. All the LED headlights I featured in this article never fell down the 6000K line. This is to ensure that no matter what item you intend to buy, you will have the light you deserve! Typical halogen lights produce warm white color (that almost seems like yellowish illumination) that ranges around 2000K or a little more. It is always better to settle for more. It is more comfortable and safer to drive with an LED headlight that features 6000K of color temperature or more. This is the range where you can see a bright yet cool white light. Switching to an LED adheres to the principle of caveat emptor. Another reason to love LEDs is they are relatively more durable and robust. All LED headlights featured in this article are waterproof – which is a very big plus! The higher the IP level of your headlight, the less worry you take. IP is the unit used to measure the waterproof level. It is also important to note those models that are weather proof. You would be grateful to have a system that can operate even in harsh conditions. It is inevitable to drive on pothole strewn holes and our cars are undeniably subjected to daily vibrations and shocks. Incandescent bulbs are delicate and cannot withstand such forces; meanwhile, LEDs are invulnerable to vibrating conditions. LEDs are compact sized. This means engineers and manufacturers have plenty of room to be creative when it comes to designing headlights. They take this one to their advantage by intelligently adding cooling systems that prolong the life of the headlights and promote efficiency at the same time. The right LED headlight must meet certain guidelines. Read on and see the things you should look out for. This one follows the golden rule, the higher the better. Somehow, you won’t be making any sense if you purchase LED headlights only to settle with warm, yellowish light. That’s why I highly recommend going for 6000K minimum. This is to achieve a cool white color temperature. 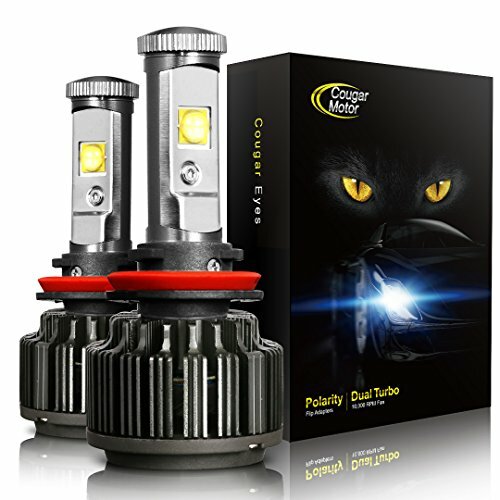 LED headlights with budget-friendly price tags that surpassed the standards include the NINEO LED Headlight, CougarMotor (H11, H8, H9), MicTuning H4, Lightening Dark H11, Auxbeam H11, and Simdevanma (H11, H8, H9). They all come at below fifty bucks – affordable but do NOT disappoint. If you are looking for the whitest of them all, you should go for Glowteck LED. At 6500, it has the highest K level of all models I featured in this article. It comes above the seventy-dollar mark but is totally worth it. There is something more important, if not as important, with the color category. It is the brightness level of your unit (measured in lumens). What good will white light bring if you can’t even see ten feet away. This category also follows with the rule, better be higher. If you want to settle for enough brightness, you should go for the Auxbeam H11 with its 6000 lumens of brightness. It can sufficiently light up your way without dazzling other drivers on the opposite lane. If you want to go for more, there are also wise choices for you. At 7200 lumens, the most affordable choices include the Nineo H11, Cougar (H11, H8, H9), and Lightening Dark H11. They make a better driving experience by giving you a brighter night. At 7000 lumens, it is also wise to go for the OPT7. It can provide better beam patterns with its exclusive Arc-beam lens technology. The package already includes everything you need. We also recommend the GlowteckH13 because of its cool, premium-looking design. It comes with 8000 lumens with a rare attribute – the first to be adjustable. The HIKARI makes the competition tighter with its 9600 lumens. Its edge is being Japanese-made; ensured quality and high-grade materials. If you want to have the best of what the industry can offer, a 12,400 lumens of brightness is offered by the SNGL (H11, H8, H9). It is the brightest on the list but doesn’t glare other drivers because it throws focused light. We highly recommend the SNGL H11 with its 6000K white light and the amazingly 12,400 lumens of brightness; two to three times brighter than the other LEDs! You can easily dominate the night with this one. Another thing that makes this truly remarkable is it’s adjustable. Other brands may also have intense brightness but they lack in this feature. Others also cause oncoming traffic disturbance by glaring other drivers with unfocused light. For better output in an array of housings, this one can be adjusted in terms of depth and LED direction. Another thing to love is this can be used in reflectors and projector beams. The SNGL H11 can give you a focused light on the road while minimizing glare. A win-win situation for both of you and the opposite driver. More things to love in the SNGL is a long list of added perks. This one is made from high-quality components and materials, to justify its price. Its LUMILEDS are robust and customized only to this brand. And hey, this one is really quiet. Thanks to the noise reduction feature. This one also never fell short of safety features. The SNGL H11 is indeed the best LED headlight in the industry today. This one is also a competitive choice. Others may have higher lumen levels but this one has its own features to boast. For starters, the OPT7 comes with 6000K cool white light and 7000 lumens of brightness for the pair. An impressive feat is it can last over 50,000 hours as guaranteed by the manufacturer. The thing that makes this one standout is its Arc Glass Technology that you can only find in this brand. The brand prides itself to have the only correct beam pattern – no fog, no dark spots, and no non-linear beams. The aluminum heat sink is cold-pressed, promoting 30 percent cooler unit along with the powerful 7000 RPM dual speed TurboCool fan that cools twice as much compared to ordinary LED headlights. You can also ensure quality as this one is assembled right in the United States. OPT 7 is assembled meticulously in every step of the way. The exciting part is you can install this one all by yourself. Everything you need is included right in the box. The OPT7 is also deserving of the title, best LED headlights as it comes fully equipped with all the essentials that an LED must have with added bonuses of exclusive features. If you think none of these two suits your needs, you can go back to the buying guide for a wider selection. For sure, your first or next LED system is just among the ten listed here in the article. To wrap this all up, it is really an intelligent choice to practically upgrade your stock headlight with the LED type. 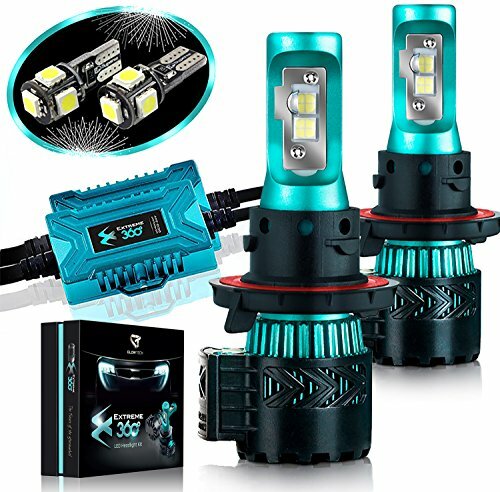 And with the best LED headlights reviews, you now have a set of good selection from which you can choose.